After something between 12 and 18 hours had passed, my beer was showing signs of fermentation – just a few patches of bubbles on the surface and what looked like some clumps of dough drifting just below every so often. I went to the lab to work on making novel emulsion droplets using nanoparticles with a postdoc in my current research group. Around noon I got in touch with my roommate, Jason, who gave me an update that a thin film of foam had spread over the surface. After about a day that foam had grown into a respectable krausen, about one inch thick. This was about the peak of activity, with bubbles coming through the blow-off tube more than once a second on the second night. Within two more days the krausen had almost totally dissipated, leaving just some patchy yeast on the surface. However, the beer still seemed impenetrable to light, and the lack of a more violent krausen had me concerned that fermentation may have not proceeded as far as I had hoped. After flying to internet forums in a panic, the prevailing advice seemed to be that I simply had to wait. To practice patience. I swapped out the blow-off tube for an airlock and otherwise sat on my hands. Today marks one week since signs of fermentation first showed, so I decided that since all seems clear (except for the beer), I would take a sample and measure the specific gravity. As you may recall, I didn’t have an original gravity reading, but I could at least estimate it based on the recipe, and if the final gravity seemed reasonable and subsequently holds steady for the rest of the week, I’ll be bottling next week. The results are in! 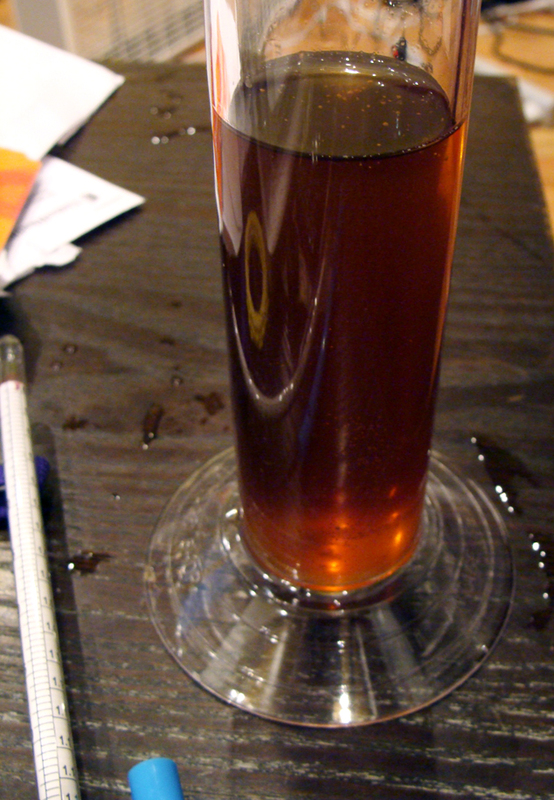 The current specific gravity is 1.014. Other brewers’ final gravities on brown ales are similar, but without having an original gravity to compare against their recipes, it’s hard to stack them up directly. The taste doesn’t lie, though, and this is definitely beer. This brew has a relatively light body and is dry as a bone. There noticeable alcohol presence (although it seems to be about where it should be) and no hoppiness, but also not a strong maltiness as I was expecting with this yeast (at least that’s what the guy at the brewshop told me to expect). Depending on how much sugar I actually extracted during the mash and depending on how accurately I hit my 5 gallon mark for the wort in the fermenter, my guess is that the ABV is between 3.5% and 4.5%. Over the next week, I will continue collecting bottles from parties and bars, and will hopefully not continue to drip dregs from those bottles on the floor of the subway train. That was a drag. 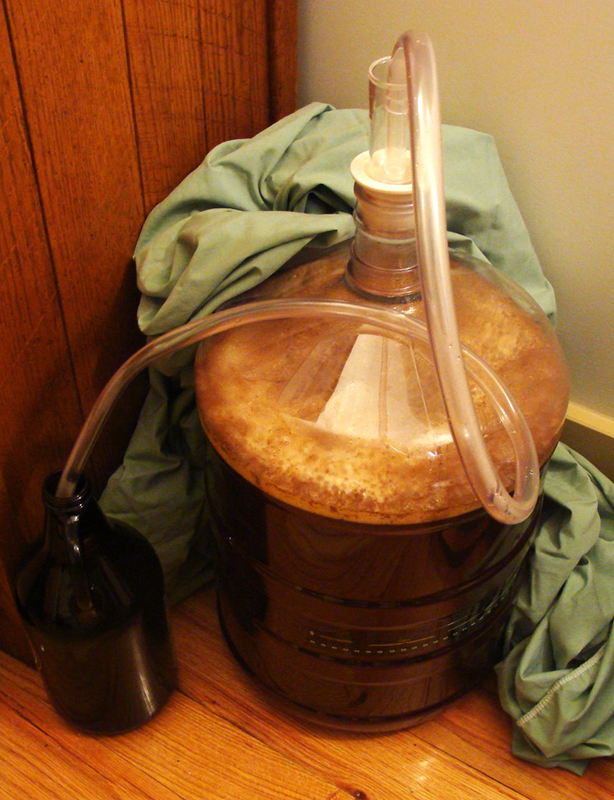 This entry was posted in learning and tagged brown ale, fermentation, first brew on January 22, 2013 by Dylan Bargteil.